Who's afraid of the big bad One? With the HTC One Mini now out the door, the Taiwanese handset maker is believed to eyeing up bigger horizons with the HTC One Max - and today we've got some alleged new pictures to pore over. 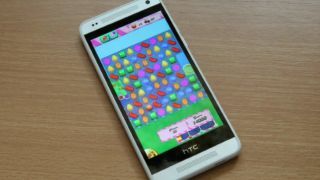 Three images have leaked along with some more details, including that the handset will come running the recently-released Android 4.3. According to ePrice, the handset will arrive with a 5.9-inch 1080p display and a HTC One-trumping 2.3GHz Qualcomm Snapdragon 800 quad-core processor, matching what we'd previously heard. The HTC One's Ultrapixel and 2.1-megapixel front-facing cameras are also reportedly on board, while the site also mentions the possibility of a stylus being included a la the long-forgotten HTC Flyer. The site refers to the phone under its T6 codename for now, though we expect this to change to something much more obvious like the HTC One Max. Assuming this is all real, HTC's phablet effort is believed to be arriving next month and going head to head with the Samsung Galaxy Note 3, which looks set to be touching down at IFA 2013.